Much of critical care medicine is a race. A relay race. Mechanical Chest Compression Devices 2015 (Updated) – The evidence does not demonstrate a benefit with the use of mechanical piston devices for chest compressions versus manual chest compressions in patients with cardiac arrest. Manual chest compressions remain the standard of care for the treatment of cardiac arrest. However, such a device may be a reasonable alternative to conventional CPR in specific settings where the delivery of high-quality manual compressions may be challenging or dangerous for the provider (eg, limited rescuers available, prolonged CPR, CPR during hypothermic cardiac arrest, CPR in a moving ambulance, CPR in the angiography suite, CPR during preparation for ECPR). This short video is a credit to our Auckland City Hospital Emergency Department Nurses. And to our Auckland HEMS Fellows. I would especially like to thank Dr Sean Fair (The University of Calgary). This video was shot in one take, then edited, all on Sean’s smartphone! Since my technical prowess peaked in the days of making a ‘mixed tape’, I am grateful for the next generation of wizardry. With thanks to the nursing team at AED. And to Dr Chase Krook (Auckland HEMS Fellow) for serving as our Lead Actor. We value your feedback. How do other services interact with their Emergency Departments and Interventional Cardiology teams? In our service, we are working with Cardiology to develop our pathways to definitive care. The ARHT has recently purchased the Weinmann Medumat Standard 2 Ventilator. The introduction of a modern transport ventilator will provide the service with additional ventilation and monitoring modalities to improve the care we can offer to our patients. In addition, our new ventilators will allow us to offer non-invasive ventilation which will be a new modality for many of our team. With additional capabilities comes increased complexity both operationally and clinically. The educational team will be commencing a simulation based curriculum shortly to train duty crew in the use of our new ventilators and in that context we would like to provide resources to maximize your learning. Please note that mechanical ventilation is a vast subject and education around this topic will be ongoing. The Auckland Rescue Helicopter Trust (ARHT) works with multiple agencies, including NZ Defence, and has the good fortune from time to time to train alongside these groups. Present were 5 ARHT crewman, our physical instructor, and several representatives from the New Zealand Police Search and Rescue unit. I went along as the HEMS medic representative and to get an idea of how in-situ simulation is conducted in other services. It was the epitome of a multidisciplinary team! 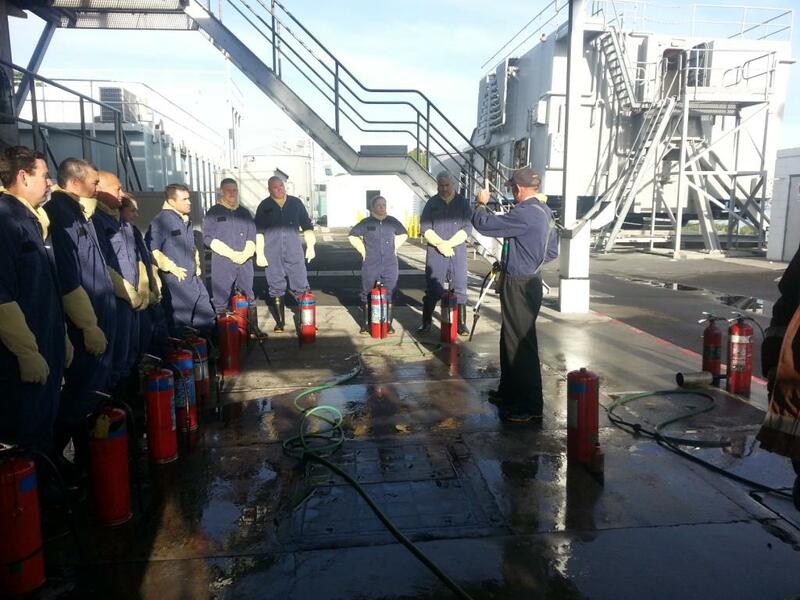 We started with the Fire-Fighting Training Unit (FFTU). 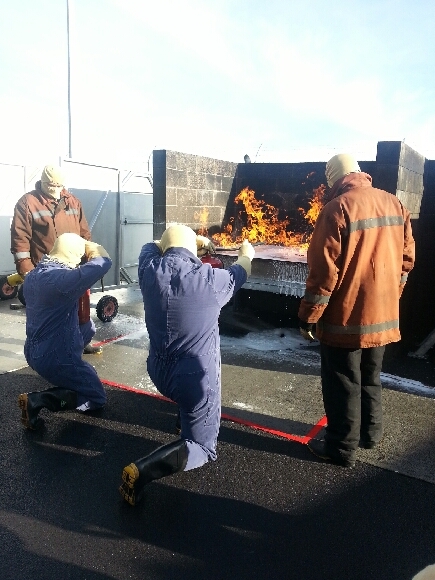 After instruction of the use of the differing methods of fighting fires, donning fire-retardant suits, gloves and masks we firstly made up our own foam fire extinguishers, then used them on a gas fire. We also did the same on oil and diesel fires with fire blankets, CO2 extinguishers and lastly dry powder extinguishers. We then moved on to the Damage Control Training Unit (DCTU). After some brief instruction on ‘shoring up’ methods (how to block leaks in the ship), we moved into the unit for a tour before the real fun began. The DCTU is a faithful recreation of a section of a ship three decks high. It is used to train Navy personnel in Damage Control (leak stopping and removal of flood water) and casualty evacuation. The DCTU uses hydraulics to simulate the rocking motion of a ship at sea; this enables students to experience the problems which can arise from the combination of motion and free surface water. Not surprisingly it was extremely difficult to keep overall situational awareness – I did most of the team leading being “hands –off”, but with my backside blocking a leak in the wall! Despite this the team worked together brilliantly. We had allocated roles beforehand. There was great use of closed loop communication, once a job was done those free returned to the team leader for further task allocation. We managed to shore up all the major leaks in the engine room (where we started) then moved to help the second team out in the mess hall with further leaks. We finished in waist deep water (waist deep if you were 6ft tall that is…!). Escape was though an overhead hatch, weighed down by water from leaks in the decks overhead – again great teamwork was put to use getting the stronger team members up a rope ladder first to open the hatch against pressure and then help the rest up through the subsequent torrent of water. There are cameras all through the DCTU – everything was filmed, the footage is then usually viewed in a de-briefing session following the scenario. Unfortunately due to time constraints we didn’t manage to see the footage from our exercise. A few colleagues were wondering what exactly an emergency medicine / HEMS doctor was doing on a Navy damage control exercise as (to quote) “it’s not something you’ll ever need to do… the ED is hardly going to sink…”. However I feel there were multiple comparisons to this training and what we do every day in the workplace, be that in the ED or on the helicopter. In-situ simulation aside, today proved an invaluable crisis resource management and team-building exercise for the ARHT group. 14 people from different services, with differing physical attributes and prior experience working together in a completely alien environment, doing something they have never done before… It suddenly dawned on me this was no different to your usual gnarly trauma resuscitation crew on an ED night shift, except with maybe a few more lives at stake! For more insight into how other high-performance services train to mitigate for the “fallibility of the human mind under great pressure” and how this can be translated into healthcare, see this post from the blog Resus Room Management. This has a link to the BBC Horizon documentary “How to avoid mistakes in Surgery” where Kevin Fong (a well-known Anaesthetist and Intensivist from the UK) explores human factors in medicine. 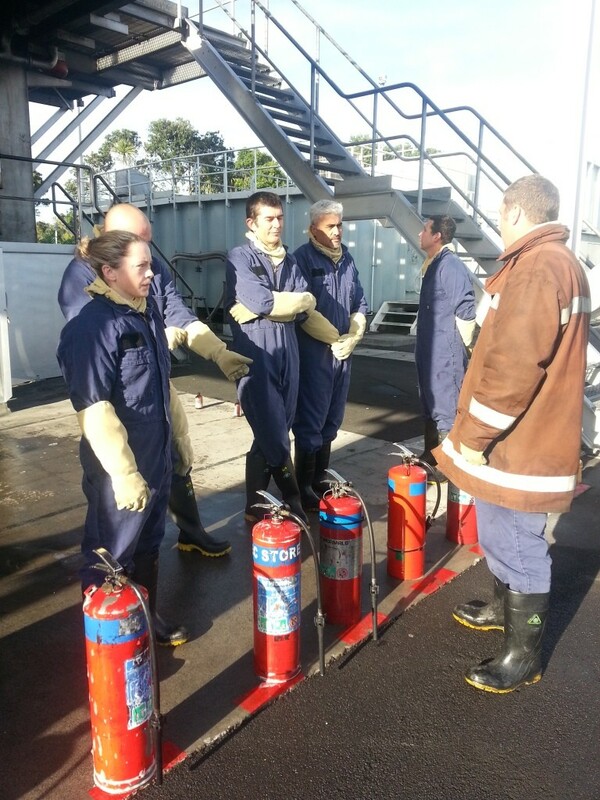 I would like to thank the instructors from the RNZN Sea Safety Training Squadron and also ARHT crewman Ati Wynyard for organising this very worthwhile training day.